Monticello Clean-up Days provide residents an opportunity to dispose in bulk of any unwanted junk or garbage that is non-hazardous. Clean up days are held bi-annually in May and October, Friday, Saturday and Sunday from 9:00 am to 5:00pm at the Landscape Waste Facility. Notice of the event will also be posted in the Piatt County Journal-Republican, on the local cable channel, and on this website. 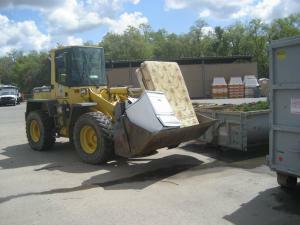 Fees for disposal are dependent upon the type of vehicle the resident uses to haul the items (i.e. truck, van, car, etc.) There are additional minimum fees for some items, such as appliances or objects containing chemicals. All electronic waste must be removed from the general waste stream. This opportunity is available only for citizens residing within the City limits of Monticello, or in Monticello Township. No commercial dumping is allowed and proof of residency will be required.